Everything Changes – The Guide to Young Adult Cancer » Are You More of a Risk Taker Since Illness? My girlfriend turned into daredevil girl after her cancer. it was like she said I beat this and I can beat anything. I admire her courage. With health issues now though it seems like every sneeze she worries she is going to die. This has gotten worse since she had her baby. I cannot imagine any of it though I try so hard. She is my hero. Kairol, I am totally the same as you are. Before cancer, I loved things that were scary enough to make my adrenaline pump. I loved the rush. I liked exploring new things and I wasn’t afraid of what was out there. I didn’t have the thoughts of “what if I get hurt?” and other thoughts like that in my head. 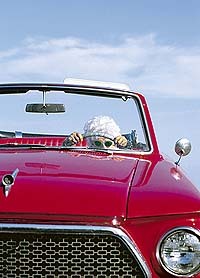 Now, I too drive like a grandma- and I can hardly stand my husband’s driving because he does not drive like a grandpa. I don’t even like to go too fast on our boat anymore. When I am out in the middle of nowhere, I think about things like how long it would take an ambulance to reach me if I needed it. It sounds warped, but I just can’t help it. Cancer made me realize how much I wanted to stay alive- not how much crazy living I could do. I think the term here is “accepting mortality.” When I was a little kid I used to say the prayer “Now I lay me down to sleep. . .” and it has the line “If I should die before I wake.” All of a sudden I realized that I took this “If I should die” as a stand alone concept. “When shall I die” takes some getting used to on a gut level, even though we all know intellectually that death is a given. I would say that in certain ways, yes I am more daring. For example, I have come out and said and done things in a more forward and open way than I probably would have in the past! I am slightly more selfish, in way that I think is for the most part, healthy- a feeling of I deserve good things as much as anyone else does, anyway, and that I might as well let life know what I want. In another sense, though, I’d say that, at least right now, I have quite a bit more anxiety, in general. I think being “hit” with the cancer experience, chemo, and radiation (almost done!) has just kind of shocked me, in a way, and I am still reeling a bit, from it all! I find myself just feeling nervous a lot more than I used to. My sense of stability has been shaken up. So it’s a mixture, for me. I was a crazed daredevil child and switched over to being a fairly cautious adult due to raising 3 small boys. I never lost the spirit of making my life whatever I wanted it to be, though. I plowed through art school and tried as many new things as I felt I could fit in, even when others didn’t approve. Some of the things I thought I would do later, then BAM. Cancer. Now I have this naggy little feeling telling me life isn’t forever and I also have this feeling like I’m actually breakable. I’m not really sure what to do with that concept yet considering I love to do things like jump off high cliffs into the river. The old me probably thinks the new me is a wuss. I do know that whatever time I have here, I will continue to reach for all of my dreams and experiment with life. Why the heck not? I’m with Anastasia. I am more daring in my personal life: asking for what I want–being clear with myself and others even when it’s uncomfortable. As for my physical well-being, I no longer enjoy a cigarette with my coffee, I wear sunscreen, I steer clear of foods and personal products with whatever toxin is currently being demonized… and I run less red lights. Every healthy day with my body is a good one. I’m with the last few comments. I have no desire for physical risks, but my lack of contentedness has created some angst in my marriage. I want to travel more, try harder to achieve more in my career. I am not content with sitting still! A friend of mine just did a parachute jump from a plane and I jokingly say that that call with the words “you have cancer” is enough of an adrenaline rush for me! I’m not any more or less afraid of the “rush” activities than I was before cancer. I’d do the less scary things (roller coasters, the big bungee thing at the fair, hiking in the Grand Canyon), but not the more scary (parachuting). I’m certainly not any more careful with small stuff (washing knives) — though I’m occasionally aware (and thankful) that if I cut myself, I do not risk neutropenic fever. How fabulous only to need stitches! I wear sunscreen, I have cut out plastics, I’ve drastically reduced chemicals in my food (sweetners, HFCS, pesticides). I’ve become more motivated to take care of my body (food, exercise, sleep, stress) and to push it (I just finished my second triathlon). I’ve been going to an awesome therapist to deal with baggage (mostly not cancer-related) so that my buttons don’t get pushed as easily so my stress level is lower, my interactions and relationships are more positive, which makes life nicer. Why live longer if we’re not going to live freer? I wouldn’t say it’s made me more of a risk taker, but it’s given me a push to do and accomplish things that I’ve been wanting to do. Because as you said, life and humans are breakable so I don’t want to waste any time just sitting around and waiting to shatter. I haven’t changed in some ways-I still love an adrenalin rush, will go on any amusement park ride there is, want to sky-dive and bungee-jump, etc. But in the smaller, day to day things, I’m certainly more laid back. You’re far more apt to find me reading than at a skate park. I’m not 100% sure, though, that this isn’t more due to simply growing up rather than the cancer. Frank – You bring up a great point that I think about often: what changes in my life are due to having cancer and what changes are due to the fact I was diagnosed with cancer at 27, an age that is ripe for a lot of growing up and changing. I am much less of a daredevil than before, but I guess that isn’t saying much b/c I wasn’t really a huge risk taker before. Now I eat better, drive more carefully, lock the doors and windows, carefully take my meds completely as directed, etc., etc., etc. I’ve turned into a prude. Although I believe I have a lot of passion in my life, my comment makes me wonder if people think that is the case! I just have the overpowering urge to get a tattoo. On my mastectomy scar. Not that exciting or daring, but certainly a change from before my diagnosis! My husband is keeping me grounded, however, so no ink in my future. :-) Cheers to everyone on this blog!